Last week, Felicity and I visited SPARC in San Francisco, and one of the things we picked up there was a Kiva chocolate bar. I’ve gotten these in the past, and I really admire their quality and careful attention to detail and consistency. This time, I happened to notice a cardboard package insert with the bar. Kiva is really trying to educate and alert people, to avoid that embarrassing overdosing problem when people who’ve never used edibles end up calling 911 and think they’re dying or something. Since I spend a lot of my own time giving out the same kind of advice, I’m with that 100%! But their consistency and the cardboard gave me an idea. Since ¼ bar has 15 mg. of THC, breaking one into 16 pieces would give each piece pretty close to a 1 mg. dose, so that would be a relatively easy and standardized way for people (or at least California patients) to quantify their tolerance or sensitivity to cannabis. As it turns out, a single 1 mg. piece gave me just about the same effect/highness as my now-standard two tokes from my MFLB. So I’d say that my typical microdose is 1 mg. of THC…just 1/1000 of a gram! Just as two MFLB tokes get me to a  — a nice tweak to my mood, but in no sense high — four tokes get me to a , which is definitely (yet safely) high. And I’m pleased to report that two of the 1 mg. pieces produce exactly the same effect. If it took someone four of these small pieces to get high to a level , they would have twice the tolerance (or half the sensitivity) to edible THC than I do. So, properly and carefully cut up, this single Kiva bar could give me 60 medical or 30 recreational doses of cannabis (not half bad for $10!). And I’ve managed to maintain this same sensitivity — effectively zero tolerance — through over two years of daily use, simply by not getting way high all the time. How tiny is your tolerance? Do yu ship your products to Florida? I don’t sell anything but ebooks, but Kiva can’t ship out of California. Hopefully Fl will become a part of the movement. I have ADD, depression, HTN, anxiety and I am really over taking 5 pills a day. i live in turkey and how can i take it this chocolate ? You can’t. It’s only sold in California to medical marijuana patients. I also have very small tolerance. I am vaping about 4 times a week and I use very small amounts. I have to say I love it, because I don’t spend very much on weed and still get high whenever I feel like… I don’t even pack the trenches of my MFLB full. Last time I did that I got high twice vaping and then ate the rest and went flying.. 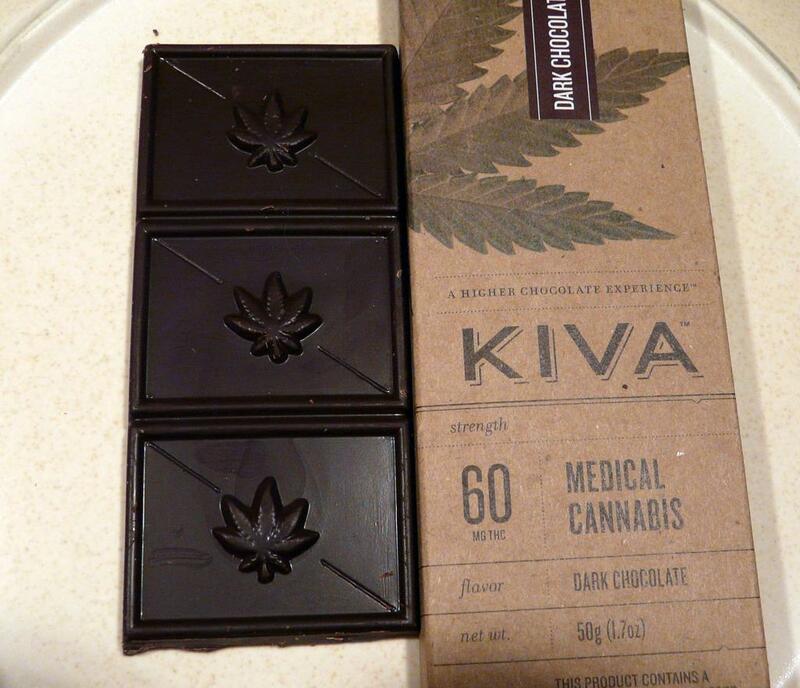 I have a question: Can I refrigerate this Kiva Espresso Dark Chocolate bar I just purchased today?.. I assume so… Thought I’d ask. Great, informative article! Well, if you’re not going to either eat it now or give me some, the fridge is definitely the best place! Nugs and hugs!